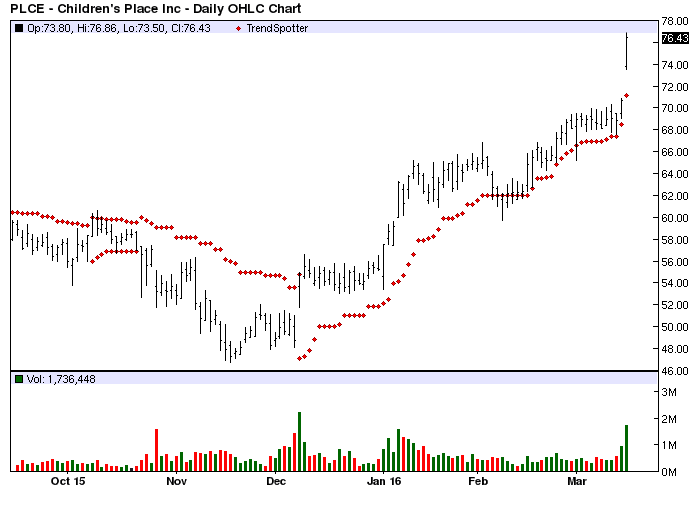 The Chart of the Day belongs to The Children's Place (PLCE). I found the children's clothing and accessory retailer by using Barchart to sort today's All Time High list first for the highest number of new highs in the last month, then again for technical buy signals of 80% or better. Next I used the Flipchart feature to review the charts. Since the Trend Spotter signaled a buy on 12/8 the stock gained 39.52%. The Children's Place Retail Stores, Inc. is a growing specialty retailer of apparel and accessories for children from newborn to twelve years of age. The company designs, sources and markets the products under the proprietary `The Children's Place` brand name for sale exclusively in the stores. The merchandising objective is to provide the customers with high-quality, fashionable products at prices that represent substantial value relative to the competitors.